The Clover Canyon brand hails from California and its joyful, colourful aesthetic gives this away at every turn. Exciting prints and contemporary technology are thrown together with old world craftsmanship to produce looks that are cutting edge but beautifully styled. 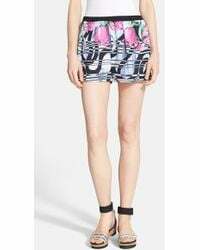 The shorts line from the brand includes ultra contemporary skorts and Bermuda shorts with metallic edging. There are pleated and tailored designs, as well as high-waisted styles and loose, floaty party shorts. The most distinctive factor of the shorts range is the broad spectrum of prints 'from florals to Palm Springs 'and the bold use of colour, from black and white through to neons.